I’ve often recommended switching to a diet higher in natural fats and lower in refined carbohydrates. What’s the deal with dietary fat? Simply put, dietary fat does not raise insulin. And hyperinsulinemia is the main driver of obesity. Hyperinsulinemia means literally, high insulin in the blood (hyper means high, and -emia means blood levels). So, logically, switching refined carbohydrates (raises insulin) for dietary fat, can lower insulin levels significantly even if you take the same total number of calories. But what is so different about dietary fat compared to both protein and carbohydrates that makes this true? It all comes down to the different ways that proteins and fats are metabolized. This also illustrates the difference between the insulin hypothesis and the carbohydrate-insulin hypothesis( CIH). The carbohydrate-insulin hypothesis holds that insulin is the main driver of obesity, and that the main driver of insulin is carbohydrates. Therefore, if one simply reduces carbohydrates, insulin is reduced as well. I think this is not entirely true. Animal protein, for example, is highly insulinogenic (provokes an insulin response), even to the same degree as many refined carbohydrates. If you eat according to this hypothesis, you should be able to eat as much protein as you like without problems. But this is not true. The insulin hypothesis, or the Hormonal Obesity Theory (HOT), is a more complete, nuanced version of the CIH. Insulin is still the main driver of obesity, but there are many different ways that insulin can be raised or lowered. 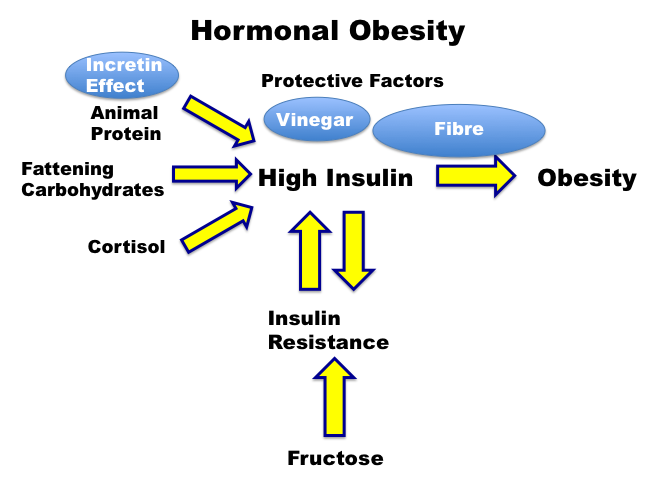 For example, insulin resistance, fructose, animal proteins, incretins, vinegar, and fiber can all be incorporated into this more complete model of obesity, which still holds insulin at the center of the web. In this case dietary protein is not given a free ride, since it stimulates insulin. If you overeat dietary protein, according to the HOT, you can still develop obesity. This is the key insight behind the more recent LCHF (Low Carb, High Fat) movement rather than the pure Low Carb movement (Atkins and others) which do not restrict either fat or protein. But there’s a fundamental difference in dietary fat metabolism that differentiates it from both proteins and carbs. It has almost no insulin effect. Why not? Because it doesn’t use the liver for metabolism. Insulin is only necessary for burning glucose, not fat. So, during normal metabolism, the three macronutrients are absorbed and metabolized completely differently. Let’s start with carbohydrates. These are chains of glucose, mostly as amylopectin or amylose. There are different forms of amylopectin (A,B, and C) which are metabolized differently. Amylopectin A is the most easily digestible and the form found in bread. Amylopectin C is the least digestible and is found in beans. The reason beans make you ‘toot’ is because much of the indigestible amylopectin C makes it way into the colon where bacteria ferment them and create gas which comes out the bottom end to the endless amusement of little boys everywhere. 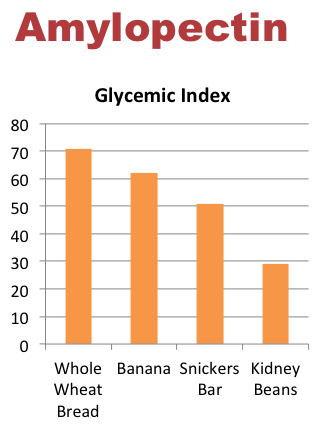 Bananas contain amylopectin B, which is intermediate between A and C.
This difference becomes obvious in the glycemic index, which is a good indicator of the insulin effect for carbohydrate foods. The GI for wheat is very high, and for beans, it’s quite low. So, carbs are not equal, and not even amylopectin is equal. It is the insulin that drives weight gain, not the carbohydrates, so beans and bread are not equal despite the fact that they are both carbohydrates and both amylopectin. The amylopectin and amylose molecules are broken down into it’s component glucose molecules and absorbed into the portal circulation. This is the bloodstream that takes the absorbed glucose and carries it directly to the liver. In the liver, it is reformed into long chains called glycogen, which is a storage form of glucose (plants use amylopectin and amylose, animals use glycogen). However, storage capacity is low so the rest is turned into fat via De Novo Lipogenesis. This newly created fat is highly saturated palmitic acid, which is how high refined carbohydrate diets increase the blood levels of saturated fat, which is linked to heart disease. Dietary protein is broken down into its component amino acids and absorbed. Some is required for protein turnover, but the amount is debatable. If you are trying to build muscle (body building) you require relatively high levels of protein. For the rest of us, a moderate amount is needed. How much? The Recommended Dietary Allowance is 0.8 g/kg lean body mass. For a 70kg man, this is about 56 grams of protein. For reference, this would be about 3 ounces of chicken, 3 ounces of tuna, a glass of milk and 1/2 cup of beans. That would be the protein needed for the entire day! You can see that most North Americans eat far, far in excess of the RDA. Consider that a typical burger now is 1/2 pound (or 8 ounces) by itself. There are many who argue that 0.5 g/kg is sufficient, too. So what happens to the excess amino acids? They cannot be stored directly as energy, so they are converted to glucose via gluconeogenesis. This is a metabolic pathway that generates glucose out of non carbohydrate molecules. Here there are differences between amino acids as well. Some amino acids are able to produce glucose (glucogenic), some produce ketones (keogenic) and some do both. Once again, these amino acids are absorbed into the portal circulation and directed towards the liver where excess amino acids get turned into glucose. Since it requires liver processing, insulin is required as a signalling molecule. Since the protein does not raise blood glucose, even though it raises blood insulin, glucagon is also stimulated, as well as incretins that help mitigate this effect and prevent hypoglycemia. It is a surprise to some, that certain proteins stimulate insulin as much as the refined carbohydrates. Animal proteins have more insulin effect than plant proteins. Does this matter? Maybe. There is a higher risk of diabetes for increasing quartiles of animal protein. Dietary fat, on the other hand is metabolized in a completely different manner than both carbs and proteins. Dietary fat broken down into fatty acids by pancreatic enzymes (lipases) and bile salts. They are then absorbed into the lymphatic system as fat droplets (fat is insoluble in water) called chylomicrons. These do not go into the portal system and do not enter the liver. Then empty directly into the bloodstream through the lymphatic circulation and then to the thoracic duct. This is the reason why dietary fat does not require insulin. There is no further processing or handling, so insulin signalling in the liver is not required for metabolism. This dietary fat can be stored or used for energy. If you were to eat pure fat (say, Bulletproof Coffee), then no glucose or protein is ingested and insulin stays low. The body then simply burns fat. There are essentially two fuel systems for the body. You can either burn fat, or burn sugar. These two fuel systems are separate and do not interact (see Randle Cycle for more details). When insulin levels are high, then the body runs on glucose. During that period, there is simply no reason for your body to burn body fat. Why would it? It’s there in case of emergencies, in case there is nothing to eat as a store of calories. It’s like a back-up generator. If you have power in the house, then the generator stays off and none of the fat is used up. However, if you switch to a low carb, high fat diet, then there is little glucose available to run that fuel system. In this case, the ‘backup generator’ will kick in and start burning fat for fuel. That’s great, because more than anything else, we want to burn fat. According to the older Carbohydrate-Insulin Hypothesis, Carbs are fattening, whereas Protein and Fat are not. Yet grouping protein and fat together makes no sense because protein metabolism has much more in common with carbohydrate rather than fat metabolism. The more insulin-centric Hormonal Obesity Theory leaves dietary fat distinct from both carbs and protein. Both agree that refined carbohydrates need to be restricted. However, because excess protein is converted to glucose, it can stop ketosis and weight loss efforts. So here, carbohydrates and excess protein are treated similarly, where fat is distinct. This reflects a far more physiologically accurate picture of metabolism. So, if you eat a low carb meal, but eat high protein (protein bars, protein shakes, whey powder etc), then your body will still be burning glucose as it ramps up gluconeogenesis to convert that excess protein to glucose. You are stuck in the ‘Burn Glucose’ fuel system. So you don’t burn fat. You want to lose body fat? You gotta burn it off. 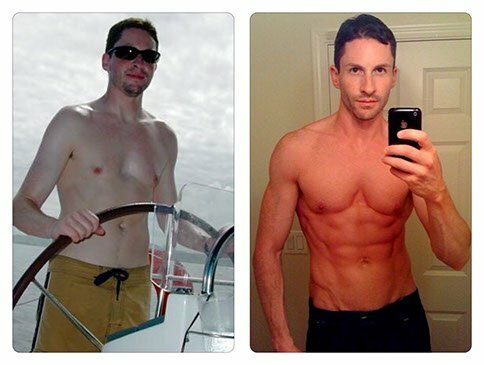 It’s the reason Dr. Ted Naiman called his website burnfatnotsugar, whiere you can still see a picture of him pre-LCHF as a pasty white 98 pound weakling when he was a sugar burner. You can see he was still allergic to wearing shirts back then too. What keeps you on the ‘Burn Glucose’ side? Insulin. Obesity is a disease of hyperinsulinemia. It’s the insulin, stupid! The solution then, is obvious – Low Carb, Moderate protein, High fat diets. “You can see he was still allergic to wearing shirts back then too.” HAHAHAHAHA + infinity. That’s the problem with getting thin, many people develop allergic reactions to wearing shirts. Try his book–or just wait for the arrival of his newest book due out in October. I’ve got the existing one, and am on the pre-order list for the next one. Great information, thank you. I do wonder for instance with Bulletproof coffee, it’s high fat, so your body has to burn off the fat from that before pulling from your reserves. So, for weight loss, should you still eat high fat, or pull back a bit on the fat to allow your body to run off your reserves? You would need to limit dietary fat so your body can “eat” its own fat. Body fat is part of your macros. I try to eat a healthy higher fat whole foods normal calorie diet on eating days (one or two meals) and nothing on fasting days. Yes, I’ve found skipping a whole day easier to balance and more effective for losing fat. Eating a calorie deficit diet every day over a long period of time is proven to lower metabolism. We call it a CRaP diet. so say implies : estimate, no certainty. The person in question asked how to determine a departure point. Your hunger feeling is a result of your ketosis, that you weren’t in before you departed. I find that people have trouble getting into ketosis unless you give them a rational handle instead of a feeling. My understanding is that the body cannibalizing itself is a necessary outcome of a caloric deficit. With that said, on a low insulin diet, the body is more likely to burn its own fat for energy than to simply reduce it metabolism, as it is proven to do on high-insulin, low-calorie diets. Nice article, and I am looking forward to your Fasting book being released in the UK. I am training for a marathon on a ketogenic diet, and find your information very useful. It’s been on sale in Britain for months, mate. His new book hasn’t been released yet. It’s going to be available on Amazon around October 18, 2016.
if you are losing weight and producing blood ketones well into nutritional ketosis (averaging 2 mmol now) but still taking 1,2 gr/lean kg in protein, how is this possible if 0.8 is the actual number ? Are you sure it is not 0.8 gr per lean POUND ? If I eat at what you mention (I have experimented a bit) I remain hungry but am in ketosis. A 50% difference is not because all humans differ I think ? Doctor, I know you mention coffee as a good thing to drink, but I wonder if the cortisol from caffeine is something to worry about? Btw thanks for your book, my blood sugar is near normal, my a1c was 4.5 and I’ve dropped 30 pounds. I needed this info 40 years ago, I’m angry at the system doc and grateful for finding your book on Amazon last April. You should devulge this info at a doctor conference I would like to see the Coca-Cola reps jaw hit the floor. When govt. scientists ran experiments determine the RDA for protein, they found that .4 grams per kilogram was sufficient for 98% of the population. To ensure that everyone received sufficient, they doubled the RDA. Kind of like they did with the salt, which negatively impacted a minority of folks, so they recommended to lower it for everyone. Amazing as always! Thanks for taking the time to share your expertise and understanding! There are quite a lot of people successfully following the Ketogains protocol that includes macros of 0.8 to 1.0 gram per pound of lean body mass (more than double the amount of protein you cite here) and they are not getting kicked out of ketosis. You say the dietary fat can be stored or used for energy. Is it difficult for dietary fat to go into storage? Isn’t this storage of excess dietary fat able to happen even with low levels of insulin? Why are we not being cautioned against consuming more fat than our body uses, if we store what we don’t use? I’ve been wondering the same thing! I’m not scared of fat, like some people who were raised in the 1980’s, but wondering if I’m exceeding my fat limits. Dr. Fung wrote a series some time ago and he discussed this. The mistake is in the assumption that the caloric needs of the body remain constant, they don’t. If you are taking in more calories than you consume AND your insulin isn’t out of control then your body will ramp up calorie burn to compensate for the additional calories from fat. Remember the body has a “set weight” that it will try to maintain regardless of varying calorie intake. Exactly! I think a lot of folks missed that talk or don’t remember that aspect. If you have stable insulin, over eating is not going to cause much fat gain. WHY does the body have a set point? How does insulin drive glucose into cells? Is the insulin broken or the set point thermostat? What organ is the thermostat controlled in? This reads like a virus that nobody can see. Science does that but…..it’s hard to be sure what is really going on. Most doctor’s think mind controls everything, and everything is a mental problem and walk around with a pack of psyche meds that are their favorite at any one time. There’s a lot more to go. I’m wondering though too if it’s also similar to his analogy of a generator. If you have dietary fat coming in, even though insulin isn’t storing it, why would your body access fat storage unless there is some deficit. Then also wondering what happens to a vast amount of excess fat, say beyond a sickening amount of oil, say 5k for a week. Great article though. I’m grateful I can put this understanding to use to drop another 20lbs before I fully understand the complexities of what I eat. With regard to the animal protein vs plant protein chart, the amounts of plant protein in quartiles are actually very small. For example, this is probably comparing about 7%E plant protein in the upper quartile with 18%E animal protein. It is not comparing like with like. 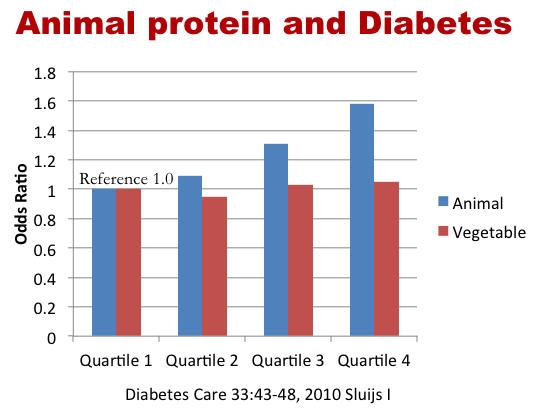 Comparing the upper quartile of plant protein with the lower quartile of animal protein is comparing two similar amounts, and there is no difference. In normal metabolism the glucagon response to protein cancels out the lipogenic effect of insulin. Dr. Fung, isn’t this a game changer for LCHF? Now, two of the three micronutrients make us fat (carbs and excess protein). Are we going to find out that healthy fat is not as healthy as we thought it was? “Moderate protein” is very vague. This is a wonderful article, but it kind of makes me loose faith in all that I’ve learned from you about LCHF. I guess the “only” thing that truly works is intermittent fasting. I hope that doesn’t change. Of course, you’re not telling people to skimp on protein, and IF is a good way of keeping essential protein (which is essential, whilst carbs are not) within a sensible range…? Dr Fung, are there any medications on which IF would be ruled out? Excess protein not stored as muscle can be oxidised or used in gluconeogenesis. In Dr Fung’s regime the lack of carbohydrate intake means gluconeogenesis using protein is inevitable. Gluconeogenesis is a demand driven process and more of a constant background process, the rate for gluconeogenesis process is unaffected by excessive protein intake. I tried whey protein for weeks (only ) and lost no weight. I tried tuna for five weeks only and gained 1,5 kg. I blamed LCHF for this and thought it’s all crap like the other diets and empty promises. Now I have an explanation and I think, gluconeogenesis matters. Good for you. I have been 22:2 since May 2016 and 2day/week water fasting since the last week of June 2016. Progress on insulin resistance seems slow, but I am giving it one year to realize results. When you say “several months” do you recall about how many months it was for you to realize improvements in your insulin resistance. Thanks for this post. I have been eating ketogenically for 5 months and finally have a concise, evidence-based, physician-authored blog post to point to for people who have been questioning my sanity! The post has me questioning how I calculate my macros. I have been basing them on ratios while keeping carbs fixed at 20-30g per day. But now it seems proteins should be also be a fixed, calculated amount, not a ratio. Then upfill fats to meet daily calorie target. How many grams of protein does one need to get the essential amino acids? Dr. Fung, I have a quick question and would be very appreciative if you could respond! I was just wondering if it would make a significant difference to get all of your (moderate) protein in one meal or to break it up into smaller portions throughout the day? I actively follow you and your work, your articles and videos are amazing. I’m following your intermittent fasting advice. With LCHF I’ve dropped the 20 pounds I’ve been trying to lose for 30 years and (bonus!) dropped my blood pressure by 20 points! Dr Fung, I’m an endocrinologist treating patients in Tel Aviv. I’m recommending the LCHF diet as part of my treatment. I was wondering how you handle patients with diabetic nephropathy with GFRs below 40. Are you still recommending this diet? What is your experience? I cannot find anything online except for the study in mice. Thanks ! This discussion is very interesting, but how can I get access to Dr Fung’s replies? I don’t see any in the ‘comments’. Dr Fung do you have more information on applying intermediate fasting to Type 1 diabetes? I love the idea of setting up an “Olive Oil Bar”.. I want to do the same but add other oils to sample too, like virgin coconut oil, macadamia oil, ghee, butter, etc. Excess carbs get stored as excess fat, but what about intake of excess fat? What happens to it? Care to comment about this recent video? For example compaire whole milk and skimmed milk; low fat cheese to cream cheese. I think there is a typo in this article. The RDA for protein is 0.8g per kg of body weight (not per kg of lean body mass as stated). The Harvard website link in the article reflects this correction as does the example given for a 70kg man – assuming the man actually weighs 70kg – his protein need in the example is based on his total weight, not his lean body mass. I would welcome any comments from Dr. Fung. I have since learned that Mark Haub has taken money from Coca Cola yet he failed to disclose this fact. Another unethical researcher bites the dust. It appears that Dr. Fung is right when it comes to diet and weight loss. I have just ordered his new book “The Obesity Code” and I am looking forward to reading it. Dr Fung : You have explained that diabetes is disease of insulin resistance that has gone out of control. So it makes sense that measuring insulin resistance will tell you the state of diabetes. Could you advise what kind of tests can give information about insulin resistance ? how many hours of fasting does it take to use up ones stored glucose, before the body converts over to burning fat? Hmm, interesting that you include a picture of Dr. Ted Naiman here. I saw in an article somewhere that he eats about 150 grams of protein a day – hardly moderate.